So I've been doing pretty well with my eating and lost 15 pounds! Woo hoo! I got off track a little - it is so easy to forget how good you feel when you eat good. My husband and I went a whole month without eating out (to be healthy and save money) and when we went out for a friend's birthday, we got so sick! 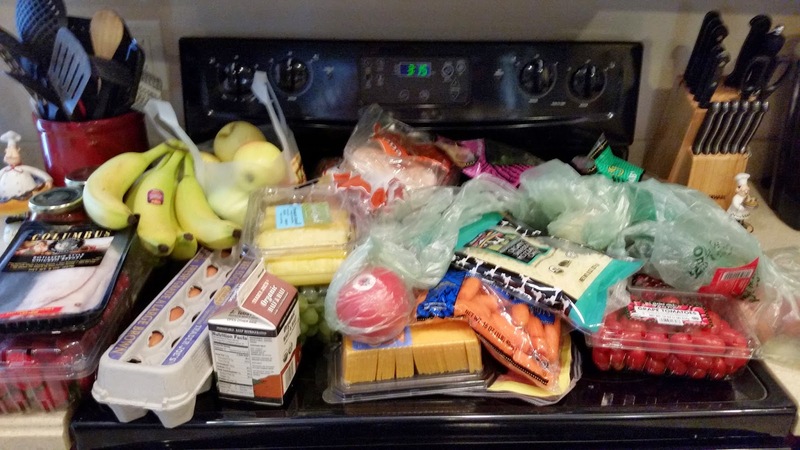 I am taking a 30 day challenge to clean up ourmy diet - which means my husband is along for the ride. We are eliminating as many processed foods as possible. There are so many awesome resources out there on clean eating - some of my favorite clean eating blogs are 1oo Days of Real Food and Whole Foods New Body. I will admit - we probably won't be perfect, but who is? I say if we have eaten 85% clean, we have succeeded! There will be some obstacles - that's life, though, right? Our anniversary is this month - so we will be enjoying the Melting Pot. (I am not sorry!) There's also a day or two that we will be traveling and we'll do the best we can. Other than that, I hope to 'clean up' my diet as much as possible! I know at the end of our 30 days, we'll feel so much better. Today was actually day 2 - I'm a little behind! I went grocery shopping at Trader Joe's and was ready for the week.